Japan Fund for Global Environment (JFGE) provides grant to Non Governmental Organization (NGO)/Non Profit Organization (NPO) engaged in environmental activities. If you consider applying for our grant program, please kindly follow the guidance page below carefully. At first, if you are Non-Japanese organizations, please check this quiz! Application period for FY2019 is from November 5, 2018 to December 5, 2018. Please apply within this period through mail. Otherwise the application cannot be reviewed nor examined. Also be aware every document must be submitted in Japanese using official Japanese forms. The JFGE Management Council deliberates and examines the applied projects, then decides on the projects to receive the grants along with the amount to be awarded. The grant is awarded only after performing the scheme of the JFGE Grant Policies and Procedures. Note: Every grantee is required to submit final report both in word(Part1-4) and excel(Part 5). For excel, please use either Part 5-1 or Part 5-2. All Request forms for JFGE should to be written in Japanese. 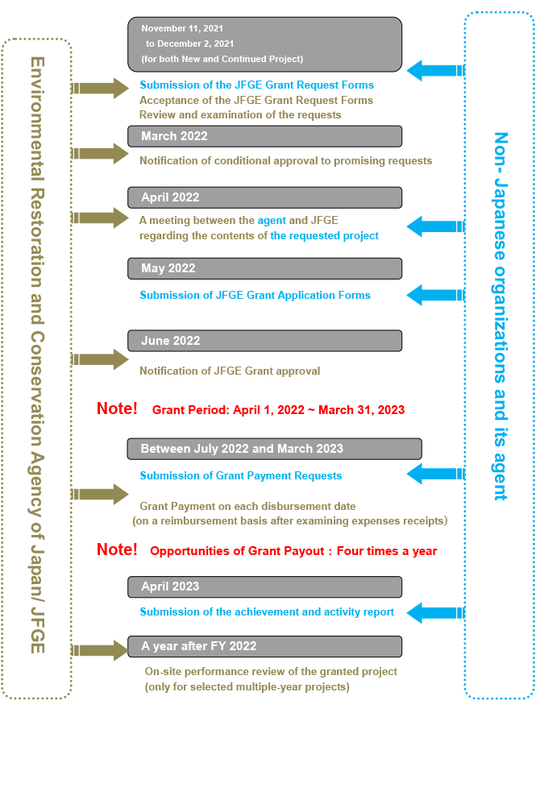 Japanese agent is necessary when applicants apply for JFGE Grant, so please find the agent by applicant. Fluent oral and written Japanese skill is needed to act as agent. The agent's main role is to act as interpreter between grant recipient and JFGE, and transfer grant to the recipient. Are you a nonprofit organization implementing environmental conservation activities in developing countries*? We are sorry, but you are not eligible for JFGE grant. Do you have any agent (organization or individual) that has a bank account in Japan and can communicate with JFGE about the project both verbally and writtenly in Japanese? Find an agent by yourself and come back here again. you are eligible for JFGE grant.